After having a successful summer release of the K.R.A.C.K-A.L.B.U.M, Bo-Dean aka Mr Kracknificent is back at it again!! 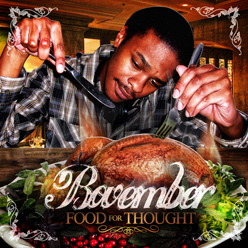 This time hes giving yall Food For Thought on the highly anticipated "Bovember"!!! This tapeis filled with smooth soulful hip hop production with great story telling and the wittiest lines we've heard from Bo in a while. He's back and better than ever!! Enjoy everybody and expect big things from this kid in the future!! !